Dubai: Former President of Pakistan Pervez Musharraf said that he would contest the next general elections in all four provinces of Pakistan. "Mine will be a nation-wide political party and I will contest elections from all the provinces of Pakistan," said Musharraf when Gulf News asked him what his constituency will be to contest the elections. In a hurriedly called press conference in Dubai on Friday, Musharraf finally allayed doubts about his return from self-exile, and said that he would go back to Pakistan by March 23, 2012. "I can go even earlier depending on the political environment in the country, but March 23, 2012 is my deadline to return," he said in his penthouse apartment in Downtown Dubai overlooking the world's tallest building, Burj Khalifa. Musharraf will land in Lahore, the stronghold of his worst political enemy Nawaz Sharif. "I have chosen this date and the place because this day we celebrate Pakistan National Day to commemorate Pakistan Resolution which was passed in Lahore on March 23, 1940," he said, mentioning his return will herald a new beginning for the people of his country. "I don't fear arrest and court cases and have decided in principal to return to Pakistan," said Musharraf, who has been declared a fugitive by an Anti Terrorism Court in the murder case of former Prime Minister Benazir Bhutto. An arrest warrant is out against him. 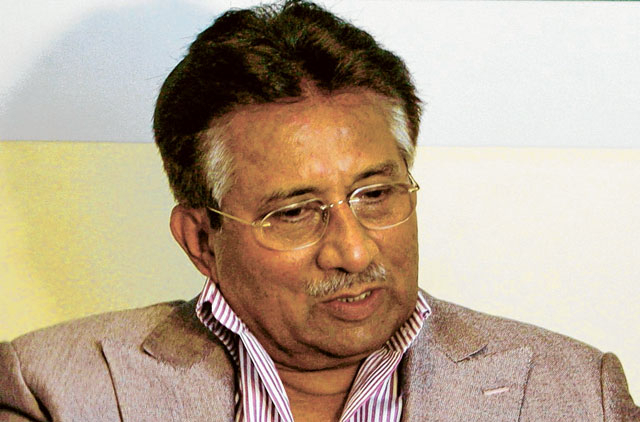 Musharraf said that he would soon launch the organisational structure of his political party, the All Pakistan Muslim League (APML), nationwide to introduce himself as a third political alternate in the run-up to the next general elections expected in 2013. The chief of APML made the decision after long parlays with his party leaders in Dubai. Some prominent members of his party including Chaudhry Shahbaz, Dr Sher Aghan, Barriste Mohammad Ali Saif, Ahmad Raza Kasuri, Gen (retd) Rashid Qureishi and Fawad Chaudhry were also present at the press conference which they deemed an historic moment. "[The] general took the decision to go back because his party was not kicking off well in Pakistan because his supporters do not give much importance to his party leaders. "His presence in Pakistan will help boost to his political party and his career," said a close aid of Musharraf who attended the recent meetings. So far he does not have people around him to win electoral seats to lead to the parliament but the retired general is banking on 60 per cent of people of Pakistan who, he claimed, did not vote in the past but will come out to vote for him. Some rogue elements in the ISI at the lowest level might have been behind Osama Bin Laden's presence in Pakistan, but former president Pervez Musharraf called it a failure of intelligence. He said a freeze on a few billion dollars in aid from USA made no difference, but alienating Pakistan would turn the war against terrorism into a ‘losing war'. But the Pakistan government would have to take steps to restore confidence.